My washing machine fills up with water then it does nothing but make a buzzing noise. It doesnt drain or anything but the motor seems to be working the belts and they are fine so was wondering what it may be? When the washer fills up, first thing that actuates is the diaphragm switch under the control header. This is directly connected into the timer. The diaphragm switch starts the timer motor listed on the diagram as TM. Check the timer motor. If its working you can see something rotating in a little window on the motor. The motor operates all the internal cam switches. Blocked Drain Pump: An object has lodged itself inside of the drain pump. There can be items such as a small sock, a coin, a toothpick, or something small in your clothes pockets when you wash them. These items can fall out of the pockets and end up in the drain pump causing it to become blocked and make the buzzing noise you hear. Here is an audio recording of a blocked drain pump. Unfortunately, the only way to fix this problem is to take the washing machine apart and open up the pump and remove the object causing the buzz sound. To find directions to take your specific washing machine apart, do a Google search for Make and Model of your washer. Motor Coupling Broken: The motor coupling has broke and the motor turns but nothing happens. This will also cause a buzzing noise which can also be described as a vibrating noise. To fix this issue you will need to take the washer apart. Here is a video to show you what to look for if your washer motor coupler is broken. Once you know that the motor coupling is broken and needs replaced, we recommend ordering the part online. Simply do a search for "washing machine model motor coupler" and you will find the part needed for your specific washing machine. Washer Drive Block Loose or Worn: The washer drive block is not tight or has worn out. The part will need to be replaced to fix this problem. Here is an audio clip of a worn washer drive block to help you to diagnose that this is your actual issue. To further assist you with this issue, here is a video to show you how to replace a washer drive block. Worn Agitator Dogs: When these are worn, you will hear a clicking or crunching noise. These small plastic parts are used to turn the top of the agitator in one direction. This pushes the clothes down to the bottom part of the agitator to be washed. Here is what your washing machine will sound like when the agitator dog ears are worn. To replace these, order them online (about $5 bucks) and then install them in your washer. Here is a video to show you how to remove and replace washing machine agitator dogs. Washer Motor Burned Out: This may result in a buzzing noise depending on circumstances. The way to tell a bad motor is a distinct burning smell. This usually means your washing machine is old and the motor has died from old age. You may need to start thinking about buying a new washing machine. if that is not possible, you can buy a new washer motor for around $100 and install it yourself. Here is video showing how to remove a washing machine motor. Based on your details, I would first check the drain pump to see if it's locked up due to a piece of clothing stuck inside the pump. You can remove the pump from the motor leaving the two hoses attached and then see if the motor will start. If it continues to just hum instead of starting, then it may be losing the start voltage. The motor needs start voltage and run voltage in order to start. The motor will just hum if it's not getting the start voltage. &nbsp;The start voltage circuit is usually the red and yellow wires. Check the yellow and red wires at the motor, capacitor and at the timer for a loose connection. Make sure the red and yellow wires are pushed in all the way at the timer terminal quick disconnect plug. 120 volts should be present when measuring across the red and yellow wires. Check the white wire with the black stripe too at the timer and motor. Is there water getting to the machine? Is the water-volume selector switch set properly and are the control panel buttons pressed in all the way? If you have a Maytag® washer, is the fuse (if there is one) in the control panel at the lid-switch bracket blown? Is there a faint buzzing or humming noise coming from the water-inlet valve? 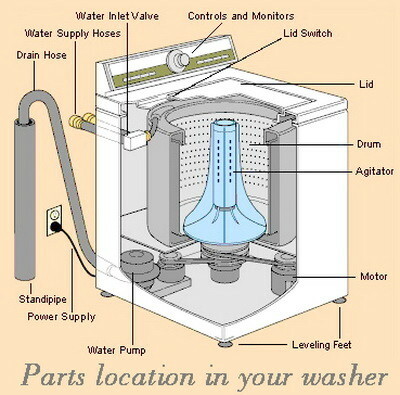 (The water-inlet valve is the device on the washing machine that the fill hoses are attached to.) If you can't hear anything, the water-inlet valve may not be getting any power. If you can hear some noise and there's water present, you may need to completely replace the water-inlet valve. please take the time to rank my reply if your happy with it. DIshwasher stopped during wash and won't run or drain. Sounds like a drain motor startup capacitor, or stuck pump. Try disconnecting power and turn the water pump manually. Some disassembly required. Then after a few good hand spins replug and try again. My frigidaire top loader fills with water at the beginning of the wash...then nothing. it just sits there full of water. Hi, could be your timer motor, timer or water level switch, first push timer knob in and manually advance to wash or spin cycle (program) then pull knob, see if machine operates, let me know, then i can tell you exactly what's problem.also advance timer, to spin cycle (program) machine should pump out water, or you can lower drain hose into bucket and empty machine, you should empty machine and try again, let me know what happened, we can solved this together. good luck. Me Estate washing machine, when started fills to specified water level then, it makes a buzzing noise then the buzz quits and nothing happens. Machine won't agitate or drain, just buzz then buzz quits. The electric motor my have failed or a part called a capacitor could be the problem? The capacitor is part of the starting circuit of the electric motor, if this fails the motor will not start therefore the washing machine won't spin or agitate. set the load size to small, fill with water. now after it fills with water do you hear anything? motor noise? If you hear motor noise, it probably has a broken motor coupler. if it doesnt do anything I would look at the lid switch and activator, the lid has to close and the switch has to know it closed. did the tab on the lid break off?